“Last month I started working with an apprentice I had never worked with before. We were installing all of the plumbing fixtures at a new assisted living facility. I asked my apprentice to install a service sink and faucet in the janitor’s room. I showed him where the janitor’s room was and showed him the fixtures with all of the accompanying hardware. Then I left him to handle some other tasks that required my personal attention. When I came back to see how he was doing, he was looking at the faucet with a slightly confused expression on his face. This particular faucet actually hangs on the wall. I asked him how it was going and he said, ‘Good. I got the sink installed, but I’ve never installed one of these kinds of faucets before.’ I said, ‘That’s fine. 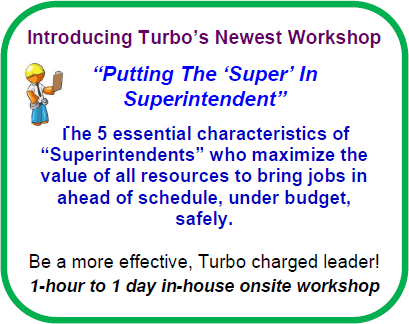 I’ll show you how to do it,’ then I used Turbo’s 3-step on-the-job training process. I talked him through the whole process of installing this particular faucet stepby- step. I told him each step to take as I carefully pointed to the various fixtures and their place on the wall. Then I asked him to tell me back each step he planned to take, the sequence he would follow when he actually installed the faucet. Once I was done, I asked him if he understood how it went together and if it seemed easy enough to do. He said he understood and I let him get on with installing the faucet. This fellow is not a ‘green’ apprentice; he’s been with the company for two to three years. I have installed many of these style faucets and I had assumed he had as much experience with the style as I do. tasks before assigning the job to them. I need to take responsibility for ensuring they are adequately trained to do their job, and carefully explain and show them how to do it if they don’t know.